Butterwick Wells makes high quality hand made photographic albums and cd/dvd folios, along with other related image presentation products aimed to meet the needs of the professional and semi professional photographer. We are a UK wedding album maker, that launched in 2010, bringing a wealth of experience from one of the most respected and skilled craftswomen of hand made photograph albums. All of our photograph presentation products are individually created by hand to the highest standard in our workshop in the heart of the Pennine Hills. We make a range of albums that blend the traditional with the contemporary to give the photographer the perfect canvas for their artwork. suede effect material and smart simulated leather, to modern metal designs. We offer two main styles of photograph album: Bookbound Matted Wedding Albums and Self Adhesive Image Books. Our innovatively designed Combi Books combine photographs and cd storage within the one album. We also make free standing double and triple wing Image Folios along with an extensive choice of CD Folio and DVD Folio disc storage cases for high quality disc presentation options. 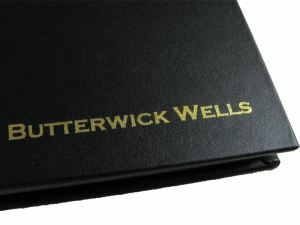 Butterwick Wells albums and folios are available exclusively direct or via our growing network of photographic distributors. We regularly attend photographic trade shows, so if you are unable to visit us at our workshop or one of our distributors showrooms, please come along for a chat.